Finding the right school for your child is not always easy, particularly when that school is in a different country. 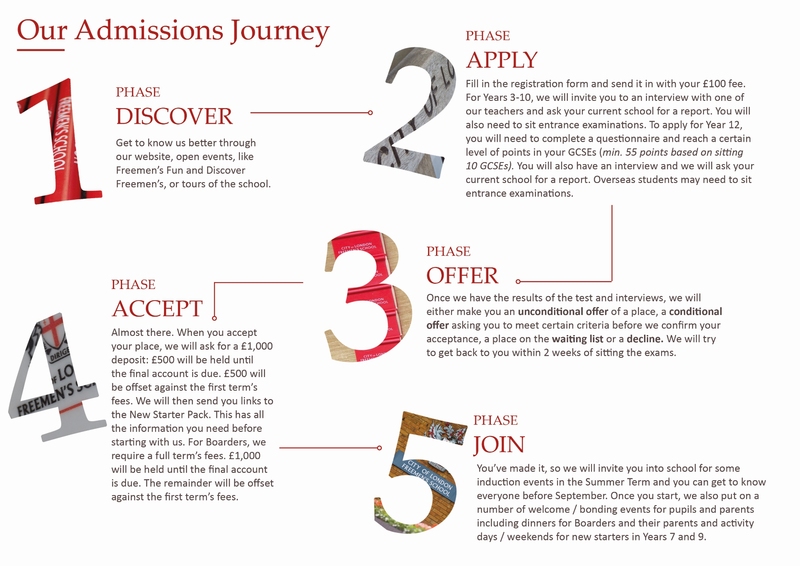 At Freemen’s, we know just how stressful this process can be, so we will guide you through every stage of our 5-step Admissions Journey. If you have any queries or concerns, our dedicated Admissions Team is only a phone call away. We are a diverse school and welcome students from across the world. Current and recent students have the following nationalities: American, Australian, Belgian, British, Canadian, Chinese, Czech, Danish, German, Hong Kong, Indian, Irish, Japanese, South Korean, Lithuanian, Malaysian, New Zealand, Norwegian, Portuguese, Romanian, Russian, South African, Spanish and Sudanese. Currently about 90% of students are British. You do not need to sit the entrance assessments at the school. We can arrange for you to st the exams locally and be interviewed over Facetime or Skype. 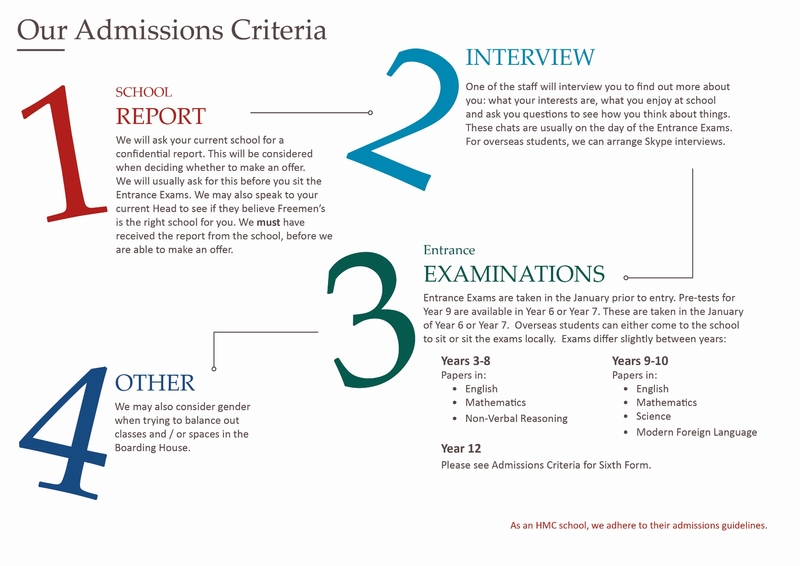 We are a selective school, but we have set out all the criteria that we will consider when looking at your child’s application below, so you can be clear from the start. We do not just look at the entrance exam results. We will meet with your child in person if possible or over Skype, obtain a school report and often talk directly with your child’s current Headteacher. If you can sit the papers at the school, we will invite you to join us for the regular entrance exams in January. Otherwise, we can either arrange for you to sit entrance exams in your current school, at your agents’ office, if appropriate, or at a local British Council Office. We do not have a minimum IELTS score for entry, but we would expect an IELTS score of 6.5 if you intend to study at A Level. We work with a number of Agents worldwide to help introduce us to students. The School’s aim is to deal with reputable agents who are paid to provide an introduction service for potential pupils who are resident abroad to mutual benefit. The School is looking for pupils who will benefit from and enjoy their education at The City of London Freemen’s School; it is in no-one’s interests to accept pupils who prove to be unhappy or unsuccessful. This important relationship is based on mutual trust and understanding so that both School and agent are clear about their roles and responsibilities in the process of recruiting pupils for Freemen’s from abroad, subject to space being available in the relevant year groups. These procedures have been drawn up based on experience and guidance on best practice from the UK Visas and Immigration (UKVI). The continuation of the School’s ‘highly trusted’ status (HTS) with UKVI is dependent upon establishing and following a robust procedure. All boarding students must have a Guardian who lives within 50 miles of the school and is over 25 years old. Guardians will attend parents evening, arrange exeat weekends and become the liaison between the school and the parents. We have no exeats other than the major holidays: Christmas, Easter, half terms and the Summer holidays. Once you or child have met the conditions of our offer, and you have accepted your unconditional offer, we will send you a Tier 4 Pre-Cas Questionnaire and Tier 4 Visa Application Guidance. Once we have received the completed questionnaire and are satisfied with the information provided, we will apply for your Confirmation of Acceptance for Studies Form (CAS). In the case of those students whose offer is conditional on GCSE results, we will not be able to apply for the CAS until we have received these GCSE results. This can often mean that we will not send out the CAS until very late August. We will produce the CAS on GCSE results day, once we have received confirmation. Please note that we may have as many as 60 students awaiting documents on that day. We will process them as quickly as possible. The CAS is a virtual document. We will email the CAS number and a pdf of the CAS, as you may need to show it when you make your visa application. You should not need to submit a paper copy when you apply for your visa, but you may find it useful to print a version out. We will arrange for students to collect your Biometric Residence Permit from the local post office in the first week they arrive. When organising your BRP, choose the ‘collect from post office’ option. We will need to see and take copies the student's passport, the yellow vignette visa and back and front copies of the BRP card. We will also need confirmation of their exam results and a copy of the parent / guardian consent letter, agreeing for your child to travel and study at the school. While we will try and assist you with any queries regarding your visa application, we are not visa experts so are unable to offer advice. You should take specific legal advice in relation to your child's individual circumstances before submitting any application. To apply, simply complete the regsitration forms below and return to us with the £100 non-refundable registration fee.